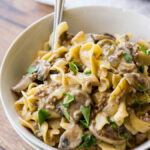 One Skillet Ground Beef Stroganoff is filled with hearty ground beef, mushrooms and tender egg noodles in a delicate, yet simple sauce. 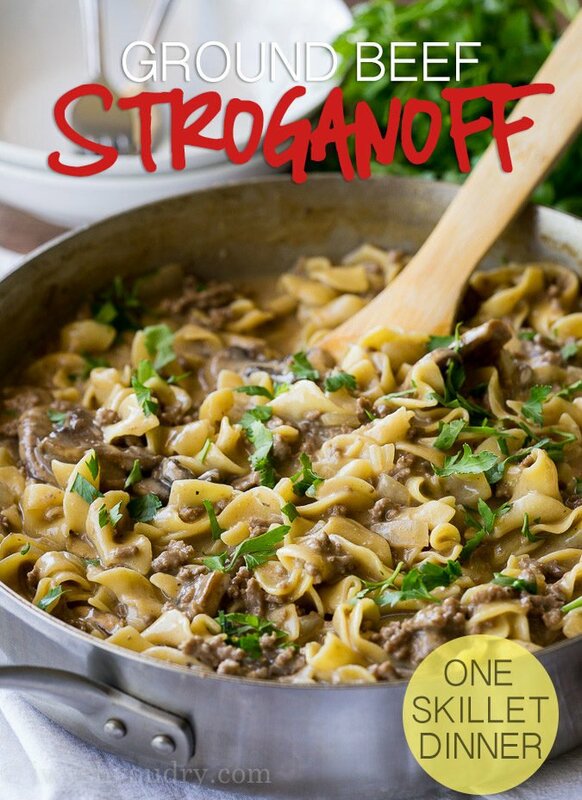 One Skillet Ground Beef Stroganoff is a super quick and easy weeknight dinner recipe, that your whole family will love. You guys, I can’t help myself. I’m simply obsessed with making your life easier. You’re welcome. 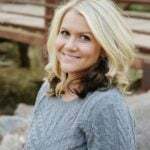 How am I making your life easier? Well, my brain won’t stop coming up with new and exciting one skillet recipes. I mean, why on earth would we need more than one skillet in our kitchens these days?!? Ok, maybe that’s a little crazy. 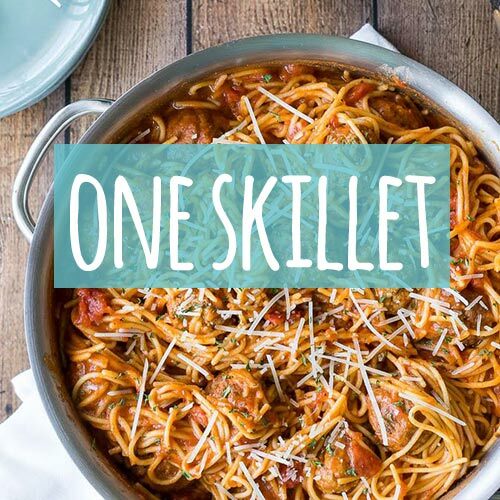 After all, what if we want to make TWO, one-skillet dinners at the same time?! Options. 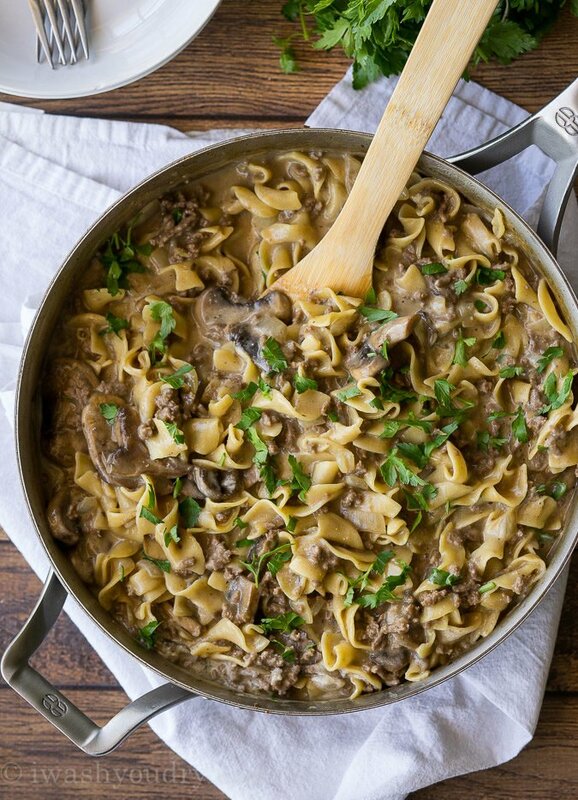 Speaking of options, let’s talk about this One Skillet Ground Beef Stroganoff. 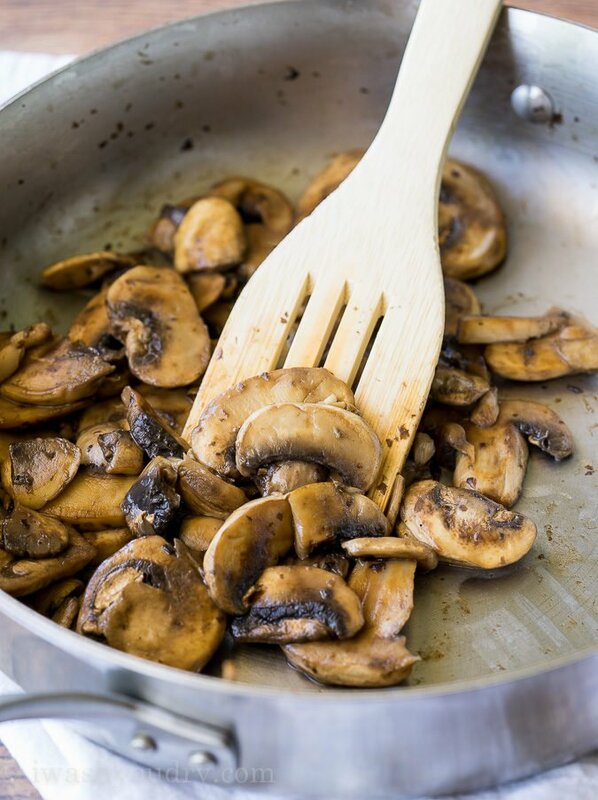 The base flavors of this simple dish stem from the mushrooms that are sautéed until tender. 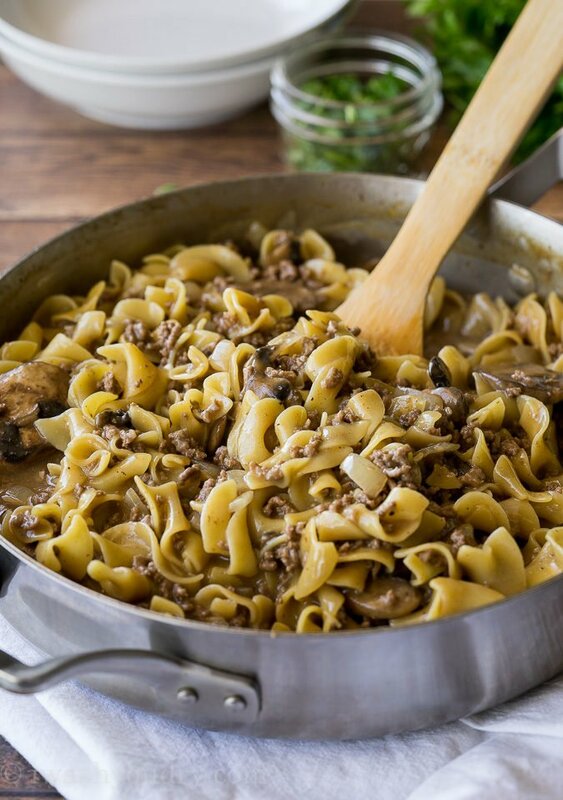 We remove the mushrooms from the skillet temporarily to brown some hamburger and onion, then pour in our beef broth and… get this… DRY egg noodles! 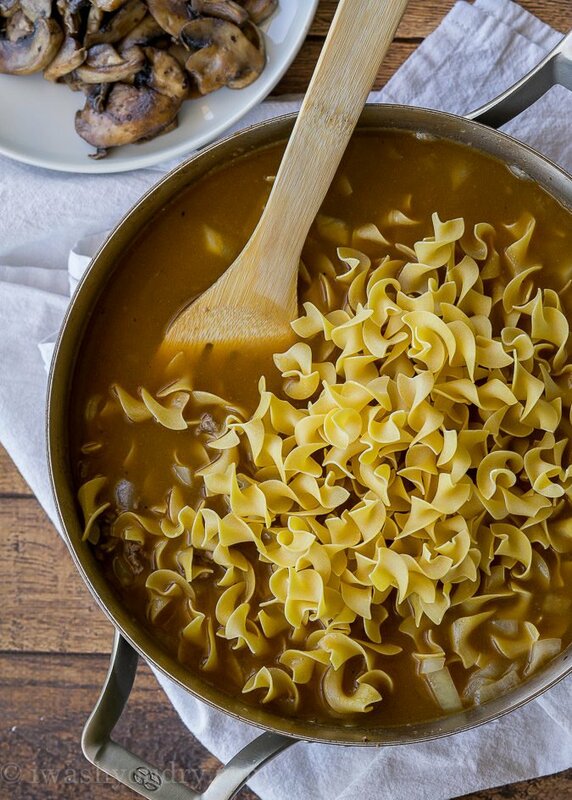 Yes, ladies and gentlemen, even the egg noodles get cooked right in the same skillet. Brilliant! Toss the mushrooms back in (hello flavor!) and let the egg noodles cook until tender. We’re almost done! All that’s left to do is add in the special ingredient that takes this beef and noodle dinner to the next level. Stir in a little sour cream to give this dish that extra creaminess. 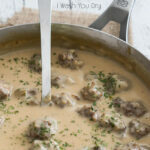 The flavors remind me so much of my Swedish Meatballs and just good ol’ comfort. 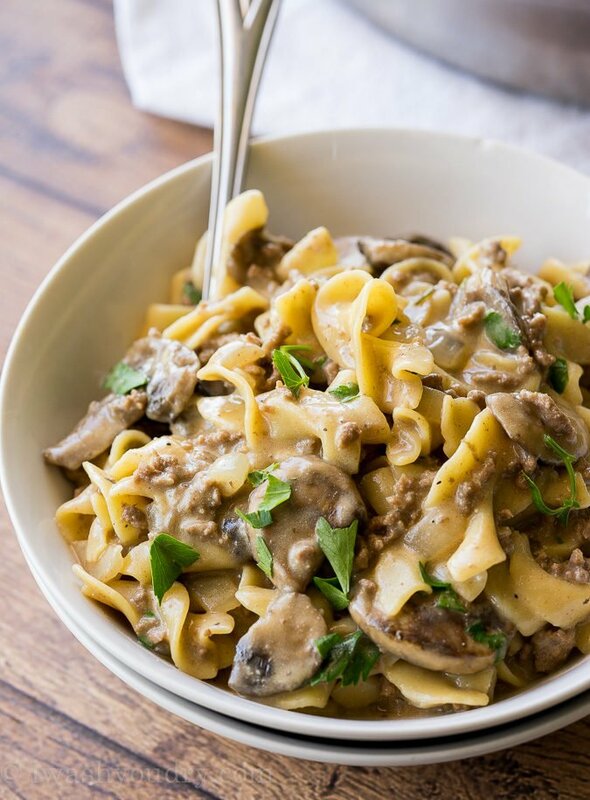 Tender mushrooms and egg noodles mingle with ground beef and onions in a creamy sauce that’s to die for. My kids each asked for seconds on this one, which is a total win in my book! Seriously guys, you’re going to love this easy, one skillet dinner! Add the olive oil to a large skillet (that has a lid) and sauté the mushrooms over medium heat, until tender, about 5 to 6 minutes. Remove from skillet to a plate. Return the skillet to the stove top and melt the butter. Add the ground beef, onion and garlic powder and cook until ground beef is broken up and cooked through. Drain any fat and return skillet to stove top. Stir in the flour and paprika until thick, about 1 to 2 minutes. Splash the dry sherry into the pan and stir, scraping any browned bits from the bottom of the pan, cooking until dry sherry is evaporated. Gradually stir in the beef broth, salt and pepper. Bring mixture to a boil and add the egg noodles. Reduce heat to a simmer and cover. Stir often until noodles are tender, about 8 to 10 minutes. Return the mushrooms to the skillet and stir to combine. Stir in the sour cream and freshly chopped parsley. Serve warm and enjoy! Hi there! I have one gluten free person that can’t have the noodles. Would it change the flavor/consistency to make the noodles in another pot? Would I still simmer the beef broth the same amount of time?? 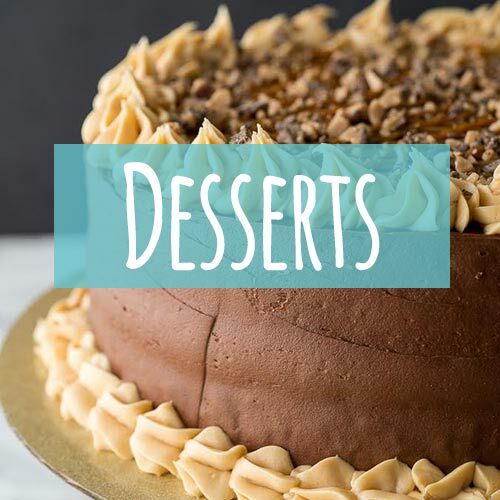 This recipe is a family favorite. 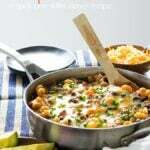 Do you have any suggestions to making it in a pressure cooker? I don’t right now, but I am going to come up with a pressure cooker variation very soon! Still in testing mode! We had this for dinner tonight. Very good! Everyone went for seconds! I used frozen mushrooms. Also I didn’t have sherry on hand so I used some red wine instead. Thank you! Hi! Thank you for a delicious recipe! I just made this for my husband and I for dinner. I have to eat gluten and dairy free for health reasons not just because it’s a fad. This looked amazing and I felt it was pretty easy for me to adjust for my sensitive digestive track. I swapped the butter for vegan butter. Delicious! (Miyoko’s brand or Melt rich & creamy are the two that I like.) 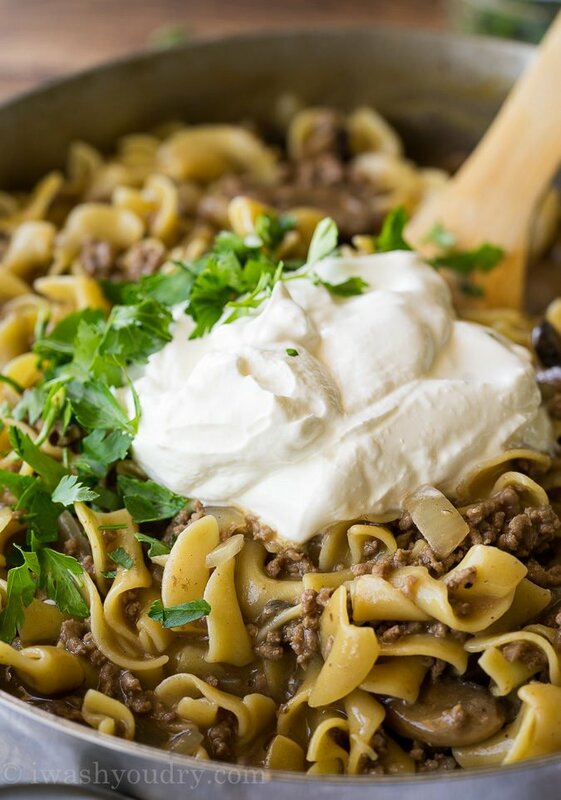 I used only 2 tablespoons of GF flour instead of 3, I used Jovial brand GF egg noodles, and I used a can of full fat coconut milk in place of the sour cream. I also went ahead with the dry sherry. Yum! So glad that I did! It elevates the flavors!!!! My husband love the flavors, the texture and asked for me to make sure this was in our regular meal rotation. That’s awesome that you were able to make this work for your dietary needs! I’m so glad you guys enjoyed it! I have made this several times. Found sometime last fall. Quick easy 1 pot. Tastes awesome ! I just have it saved to my favorites. I have used fresh and canned mushrooms both are good. I know one time I thought I had fresh parsley , it was cilantro still tasted pretty good. I will normally serve with really chunky homemade pico, balances it out well. Just made this for dinner tonight and it was DELICIOUS! I used Madeira instead of Sherry to deglaze the pan because that’s what I had on hand, but either way I’m sure it would be equally as yummy. Will be making this recipe again and again! Wow this is delicious. I found this recipe while looking for something for ground beef last minute. I didn’t even have fresh mushrooms… Just canned. I also added a couple cups of spaghetti squash because my two year old pull it out of the freezer and asked for it. Even though I had to substitute some of the ingredients, this still turned out fabulous. I can’t wait to make it when I actually have the correct ingredients. Great idea to add the spaghetti squash in there, would make a great low carb substitute! Can you substitute cream cheese for sour cream? You can, but it will change the consistency and flavor of the dish. DH made this One Skillet Stroganoff last night. It was fantastic! Flavorful and filling. Cannot wait for him to do it again. Thank you! 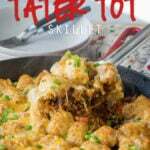 Recipe looks quick and easy so I’ll look for other recipes on this site. I’m hoping “healthy” is one of the criteria included as well. I’d also like to know how to print bec/w/o an easy to print version w/easy to find recipe it makes it difficult to actually try this recipe! Hi Cheryl, the print button is located on the top of the recipe card. You should be able to push the button and a new tab will open up on your computer and a print version of the recipe will be ready for printing! Hi Brenda, the print button is located at the top of the recipe card. Click the print button and a new tab should open up with your computer’s print menu.